When viewers are first introduced to Game Of Thrones’ Robin Arryn, he’s a young—but not that young—boy who creepily breastfeeds on his mother’s lap and shrieks for people to be killed for his amusement. Over many seasons of the show, he’s evolved into a slightly matured version of the same character, throwing babyish temper tantrums in every other scene and generally continuing to act like a spoiled little wiener. 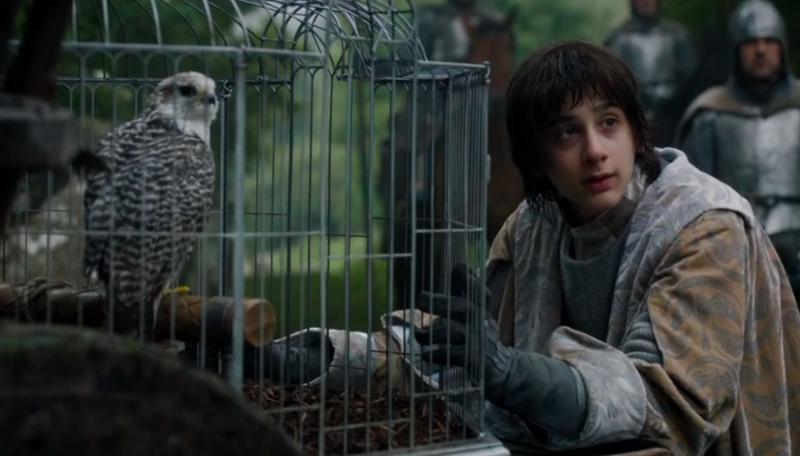 Nobody likes Robin Arryn. So, naturally, some people think he’ll be the new king of Westeros at the end of Game Of Thrones’ upcoming final season. While Sean Bean and Finn Jones have other ideas about how things will play out, Moore runs down a fairly logical theory that Robin is the only character in a position to actually triumph in the final season. She points out that Jon Snow isn’t interested in power; that Gendry (who really ought to become king) doesn’t have the support to press his claim; that Sansa is unlikely to want to return to the capital where she endured so much horror; and a litany of reasons why several more characters, from Daenerys and Tyrion to Cersei and the heads of the other great houses, aren’t situated as well as the jerky little Arryn boy. Moore describes how the Arryns have largely stayed neutral during the wars decimating the other houses, finishing her upsetting argument by adding that there’s a certain poetic symmetry to the idea that Thrones’ story, which started with the mysterious death of Robin’s father, would wrap up with his unpopular son unexpectedly taking power. This, as Moore says, would certainly be an appropriately bittersweet finale. But, it’s worth remembering that the show’s producers didn’t put Lino Facioli, the actor who plays Robin, in any of these promo photos of various characters on the throne, so this whole thing is probably just a thought exercise anyway. That, at least, is what we should tell ourselves to avoid dwelling on the idea that the show’s final scene will depict an adult man, curled up and sucking his thumb on the Iron Throne as one furtive eye glares out at the viewer. Who do you want to win the game of thrones?